A network is a group of two or more computers that are linked together. Networks are usually used to share resources, exchange files or communicate with other users. In addition to the computers and devices which are connected, other devices are often needed for the network to work correctly. Examples for such devices include hubs and switches. Different kinds of network can be connected to each other with a router. In general, networks that use cables to connect can operate at higher speeds than those using wireless technology. To have network communication technology as one large model would be difficult to implement. As a result, we split up various components of the network into smaller modules or layers. 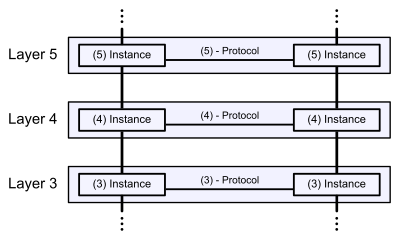 The standard model of a network is the Open Systems Interconnection (OSI) model set by the International Organization Standard (ISO). Other network models exist, though they are all split into similar layers. Each layer uses the services that the layer below provides, while providing services for the layer above it. Each layer can only communicate with the same layer on the destination device. Broadcast is a special transmission that is not meant for a single device but is addressed to all devices in specific network. It is mostly used to automatically issue IP addresses to devices by a DHCP server and to create an ARP table that maps the network and speeds up the traffic. This page was last changed on 23 March 2019, at 02:28.